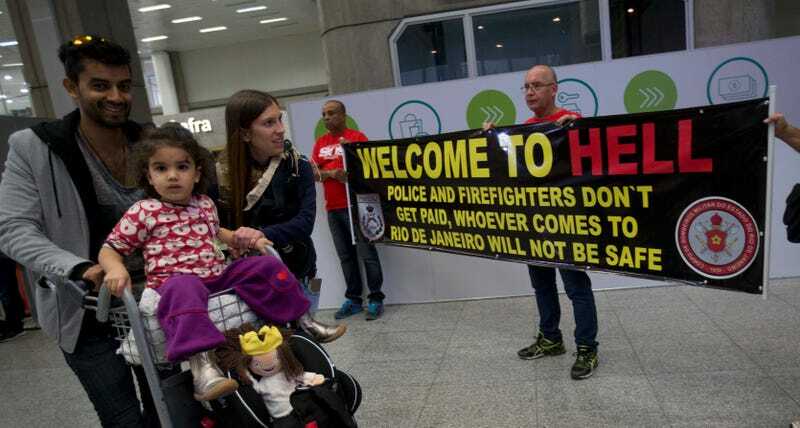 Rio Police Officers To Visitors: "Welcome To Hell"
Yesterday, members of the Rio de Janeiro police force staged a protest at the city’s airport, claiming that they haven’t been paid for months and thus will not be able to sufficiently police the city during the Summer Olympics. Eduardo Paes, mayor of Rio de Janeiro, told CNN that the state is, “Completely failing at its work of policing and taking care of people.” His comments come on the heels of the Rio de Janeiro state, which is responsible for the region’s military and police force, requesting emergency funds in order to distribute back pay to police officers. That request was made weeks ago, and judging by they protests that were staged yesterday, those funds still have not been received.